If you at all interested in cooking you will need a decent knife. There is no point trying to chop onions with something that wouldn’t go through vegan butter, let alone tackle anything like a butternut squash or a pineapple. I only realised once I bought my good knives how much I’d been struggling along with cheap, blunt knives. Suddenly so many cooking tasks became quicker and easier. Now I admit that I spent a lot of money on my knives and the things I use to keep them in good condition (more on that later). I didn’t buy them until I was 37 and I took a long time researching and trying to decide what to get. I would recommend buying the best knives you can afford – put them on your Christmas list now or start saving and aim for a date when you can treat yourself. One thing you absolutely must do is feel the knives in your hand before you buy. You can then sometimes find a good deal on the internet but you must have tried them first. They come in a variety of weights and have different shaped handles which don’t always fit your hands properly. You will know as soon as you pick them up which types are right for you. I went to Steamer Trading in Brighton which has a great range of knives and very helpful staff. They made Matthew a cup of coffee because they realised immediately that I’d need a long time trying out and looking at different knives. I eventually decided on I.O Shen which felt just right for me. One of the benefits of being vegan is that you don’t need a whole range of knives for fish and chicken. I bought the Oriental Slicer, which was the right size and weight for me and had a benefit of being easy to “rock”, which is great for herbs. I also bought a paring knife which I do use but you could save some money on a cheaper paring knife as long as you have one good knife that you love, like I love my slicer. Once you’ve got your knives it goes without saying that you need to look after them. NEVER put them in a dishwasher and keep them sharp. There are many ways to sharpen them but I favour an electric sharpener. It doesn’t require any special skills and is very easy to use. I don’t need to sharpen them all that often – probably only every month unless I have been tackling squashes or other tricky veg. You also need to store them properly. If you just throw them into a drawer you’ll not only run the risk of cutting yourself getting them out, but they’ll also blunt against everything else in the drawer. My kitchen hasn’t really got anywhere for a wall mount so I bought a block, on its own without the knives. It doesn’t take up much room on my counter and my knives are always within reach. 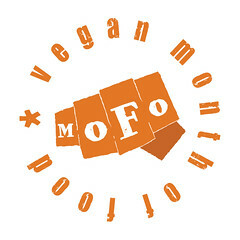 This entry was posted in Veganmofo 2010 and tagged Veganmofo 2010 by efcliz. Bookmark the permalink. Great advice! I have a good knife, but I’m looking to upgrade. Thanks for posting! That’s great advice, I’m always putting my knives in the dishwasher, throwing them in the cutlery drawer with everything else & I don’t have a knife block or sharpener!! I certainly plan to change some of that right now & I’m going to add some more stuff to my (already far too long) Christmas list. My knives are okay, but I’m sure I could do better….however, until I was gifted my decent knives, I’d been cutting everything (even butternut squash) with a crappy little paring knife. Ha! I had no idea how much easier life could be with a good knife. If you don’t have room for a knife block (I definitely don’t), you can buy cases for knives for about 4-5 dollars each. The ones I have are “Bladesafe” or something. They don’t work well for thinner (in the edge-to-non-edge sense) knives, like a paring or bread knife (in fact, my bread knife slides out all the time, which is scary…), but my chef’s knife fits really well and won’t budge. You’re so right about the importance of a good knife. They always say that you’re more likely to cut yourself with a dull knife, and that’s definitely true. I used to cut myself all the time, but since I bought a quality knife over a year ago, which I sharpen regularly, I’ve only cut myself once. This reminds me that my knives need to be sharpened in a serious way. Jealous! I have a set of Henckels that I splurged on a few years ago, but I covet that one I.O Shen knife. Years ago the oriental slicer only cost about £30-35 but word must’ve got out because it’s a lot more now! I wish I’d have bought it then.